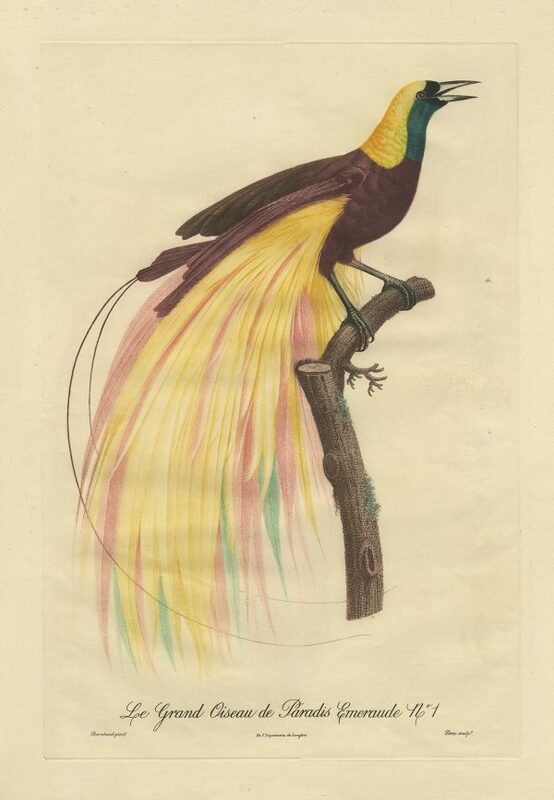 Tags: Antique Print, Bird of Paradise. Le Grand Oiseau de Paradis Emeraude No.1. Made by ‘Jacques Louis Peree’ after ‘Jacques Barraband’. Jacques Louis Peree (1769-1832) was an engraver, mainly known for the superb engravings he made after Barraband’s designs. Jacques Barraband (Aubusson 1767 – Lyon 1809). Barraband was a French zoological and botanical illustrator, renowned for his accurate depictions of tropical and exotic birds. Between 1801 and 1804, Barraband was commissioned directly by Napoleon Bonaparte to produce the watercolours after which these engravings are made. Engraver: various engravers have worked on these plates. From: “Histoire Naturelle des Oiseaux de Paradis et des Rolliers, suivi de celles des Toucans et des Barbus”, by Francois Levaillant, first published in two volumes from 1801-1806. Medium: Colour etching/engraving on wove paper.